In 2013 the Warrnambool Fire Brigade reached a milestone - 150 years of continuos operation. Prior to 1863 there had been some attempts to start a local fire brigade in the fledgling community, but they were not successful. Ultimately, on the 6th of March 1863, at the Flying Buck Inn, Liebig Street Warrnambool, a Brigade was born. Over the years it has ebbed and flowed, been strong and had struggles, especialy in the early years. It is now a strong, modern, integrated Brigade, with Volunteers and Staff working together to maintian the strenght and to maintain the service. 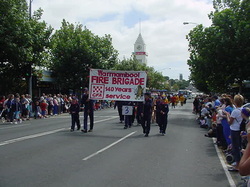 Driven in ealry times by a need to respond to fires in their community, the people of Warrnambool formed the Brigade. Now the Brigade responds to over 600 calls year; the need is still there. This section breaks the years of the Brigade into more mnagebale sections, and provides a snapshot of the goings on and battles of the Brigade over the years. Special mention to Bryan, Michele and Matt Wills, Heather Love, Max Smart, Flagstaff Hill and the Warrnambol Historical Society for the information in this account.